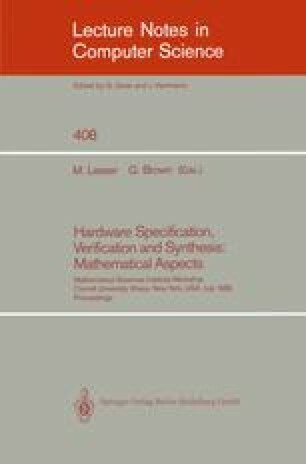 The concept of Design for Verifiability is introduced as a means of attacking the complexity problem encountered when verifying the correctness of hardware designs using mathematical proof techniques. The inherent complexity of systems implemented as integrated circuits results in a comparable descriptive complexity when modelling them in any framework which supports formal verification. Performing formal verification then rapidly becomes intractable as a consequence of this descriptive complexity. In this paper we propose a strategy for dealing, at least in part, with this problem. We advocate the use of a particular design strategy involving the use of structural design rules which constrain the behaviour of a design resulting in a less complex design verification. The term Design for Verifiability is used to capture this concept in an analogous way to the term Design for Testability.